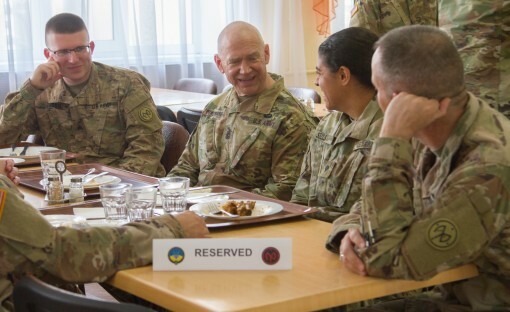 YAVORIV, UKRAINE---Command Sgt. Maj. David Piwowarski the New York Army National Guards senior enlisted soldier meets with U.S. Soldiers during a visit to the Yavoriv Combat Training Center here May 25, during a visit with Major General Ray Shields, the commander of the New York Army National Guard. During his visit Piwowarski toured the Combat Training Center and met with 27th Infantry Brigade Combat Team Soldiers stationed here.